91 p., 15,5 x 23,0 cm. With contributions by Warren Breckman, Georg Cavallar, Reinhard Schulz and Andreas Speer. Even the alleged leave-taking of metaphysics does not escape from either the epistemic, anthropological, or historical conditions of thinking. These are the conditions that will be analyzed in this paper as structural principles of metaphysical thinking. My point of departure is a re-reading of the historically reconstructable origin of metaphysics. Thereby I wish to discover the systematic concept of metaphysical thinking, which is always at issue whenever our thought seeks to critically establish its own foundations and assumptions. The systematic reconstruction is centered on the concept of convergence, which is examined here with respect to the generation of epistemic fields. Special attention is paid to the systematic and historical genesis of the fields of metaphysical thinking, and as a result medieval philosophy is particularly in focus. By the example of a controversy between Habermas and Henrich it is shown, why a dismissal of metaphysics is doomed to failure. 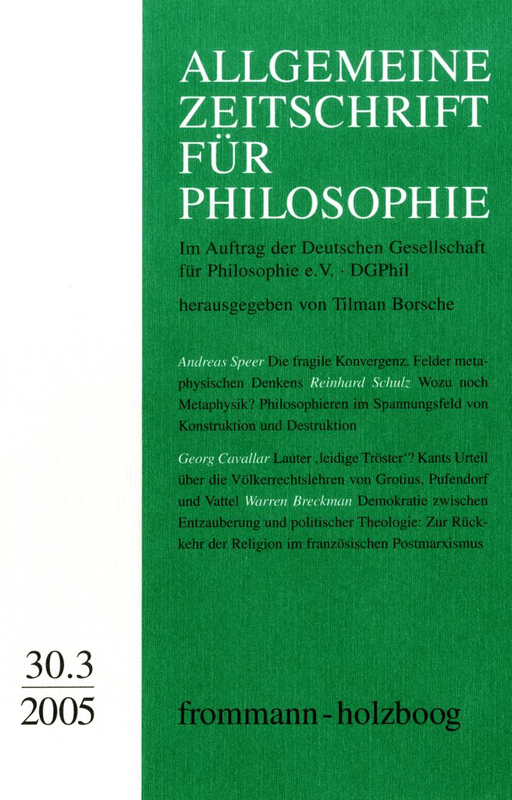 Henrich shows in recourse to Kant that metaphysics after the end of traditional metaphysical projects spring forth from the obligation, man has to give his »conscious life« a character. Following a traditional line as of Nietzsche, Heidegger, Gadamer and W. Schulz, a hermeneutic understanding of experience will be demonstrated so that the polarity of question and answer is overcome dialeetically. Thus a »metaphysics in man« (Merleau-Ponty) will be possible, to live with the paradox of human self-experience, to find only preliminary answers to »final questions«. The confrontation of construction and deconstruction should make clear that metaphysics and the critic of metaphysics relate to each other and cannot be separated. Warren Breckman: Demokratie zwischen Entzauberung und politischer Theologie: Zur Rückkehr der Religion im französischen Postmarxismus.